On Friday June 29th in Lubbock, TX, Cindy Hughlett and her band will open their 6th concert in a series of benefit concerts where 100% of the proceeds will benefit a non-profit organization. This year’s concert will feature Bryan White and will be held at the Civic Center Theater, proceeds from ticket sales go to benefit The Texas Boys Ranch. Previous concerts featured T. Graham Brown, Marty Raybon, Richie McDonald and others. Bryan White began his prolific recording career began in 1994 with the release of his certified-Platinum debut Brian White followed by back-to-back platinum selling albums Between Now and Forever (1996) and The Right Place (1997). He released six No. 1 singles – “So Much for Pretending,” “Sittin’ on Go,” “I’m Not Supposed to Love You Anymore,” “Rebecca Lynn,” “Someone Else’s Star” and “From This Moment On” with Shania Twain, along with eight more Top 40’s. The list of honors include a Grammy, Country Music Association (1996 Horizon Award winner) and Academy of Country Music (1996 New Male Vocalist winner) plus five CMT Awards, Canadian Country Music Awards and TNN/Music City News Awards. In 1998, voted one of People magazines “50 Most Beautiful People.” Songwriting credits include cuts with Wynonna, LeAnn Rimes and Joe Diffie, Sawyer Brown (“I Don’t Believe in Goodbye”) and Diamond Rio (“Imagine That”) both reached No. 3 on the charts. Cindy Hughlett is a multi-award winning Songwriter, Recording Artist and voting Grammy Member. With over 20 years of music and 9 studio albums, Cindy’s authentic style and message will not only entertain, but stir the spirit. Awarded Album of the Year, Female Vocalist and Song of the Year along with several 2015 & 2016 Grammy Considerations. www.CindyHughlett.com. 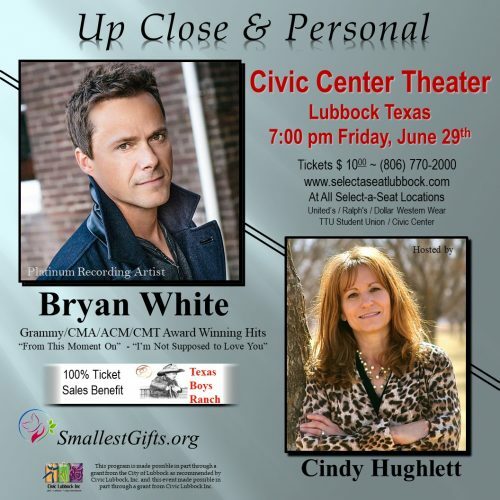 Civic Center Theater 1501 Mac Davis Lane, Lubbock Texas Cindy Hughlett Music is hosting an evening concert featuring Country Music Artist Bryan White 100% of the ticket sales thru Select-a-Seat will be donated to the Texas Boys Ranch.